THE LAPTOP MILLIONAIRE SCAM- OR YOUR BLUEPRINT TO ONLINE SUCCESS? They say “Knowledge is Power”, that Learning and discovering new things every day can go a long way to boost your Life, take you places and get you to greater heights you never imagined possible. Having that in Mind, today we want to take a look at a book that claims it has the ability to help you achieve the above stated in the Financial Spectrum, as it contains the knowledge (Millionaires’s Secret) that can empower you into transforming your Life, give you the ability to live anywhere you want and the best of all, help you attain that Financial Freedom you so much desire, through the use of your Laptop. Seeing you are here, I believe you are also wondering, is The Laptop Millionaire Scam or can it really be the blue print to your Online Success, right? Before we proceed further, let’s learn a bit about The Author of this book, where he is coming from, and why he decided to create this book. His name is Mark Anastasi, and he is the founder of the Inspired Marketing Group. Organising events such as the Traffic Generation Summit, The Millionaire Bootcamp for Women, and the Passive Income Summit. According to Mark, he has trained over 12,000 entrepreneurs around the world since 2005. Hence, his mission, to empower you and me, to take control of our financial future, experience the Laptop Entrepreneur lifestyle and live life to the full. Such a generous guy, you did say right? But does he really have your interest at heart? Or just to use you to make more money for himself? The Laptop Millionaire is a book written by Mark Anastasi, and according to him, it provides easy to follow step by step strategies you can use to make money Online. Simply put, it provides you a blueprint to online Success. It contains the same strategies he used to make millions and also includes the Success stories of other Millionaire Internet Entrepreneurs. You will need to purchase this book for $16.82 from Amazon. This book contains about 272 pages built up with 32 different ideas, on different strategies you can use to generate income using your Laptop. Mark claims you can go from zero to $10,000 in 28 days and discover financial freedom online. I choose to disagree with this, as it tends to be a bit exaggerated. Although it is possible to make up to $10,000 per month, it is not something that happens in the first 28 days. Making Money Online isn’t a get-rich-quick scheme, not especially if you have zero knowledge about how internet marketing works. There are lots of things to put into consideration when it comes to making money Online, especially using the ideas he suggested. You can choose to market your business through ads, which will definitely give you quicker results but will also cost you good money, depending on how much you have to commit into it. But this isn’t really advisable if you haven’t mastered the method enough to know how to go about it, as you may end up running a loss rather than profiting from it. Or you can choose to go the SEO way by getting your contents ranked in the search engines, and gaining free traffic that will end up generating you as much as this $10,000 per month, but with time and lots of hard work. You can get a free training on how to get started with this method. What am I saying in essence? That making $10,000 per month and even attaining financial freedom is definitely possible, but it takes time, hard work, persistence and patience to get there. Mark has also provided you with 32 different ideas to dabble in, which may seem like a great thing.. But with Internet marketing, focusing on so many things at a time, doesn’t work, dabbling from one idea to another, especially at a beginners stage will get you no where and you may end up getting frustrated by the whole thing. I think it would be better to focus in depth on one or two ideas, master them, succeed with them and maybe try more ideas to boost the other. For example, you can first of all learn how to get started by choosing a niche (the right and best direction for your business), getting ranked in search engines and attracting free traffic through using SEO method and then gradually scale up to other ideas like using Social Medias, YouTube, and gradually to the e books level, to help grow your already established business. By this way you will be sure to achieve more Success than trying to incorporate everything at once. Mark also has a web page, where he promotes activities related to his book. He has the Laptop Millionaires’ Coaching Program that you can join and then apply for his fastrack program for $20,000. You can also join his Laptop Millionaires’ Seminar or order them on Dvds. You can also get to read his blog. So is The Laptop Millionaire Scam? Definitely not! But is it the blueprint to your online Success? It has no indepth training or step by step guide on how to start and run a Successful business online. Secondly some ideas he introduces you to ends up with a link on where you can now go to obtain more knowledge about it, which means more money to be spent. And, Yes he listed various way you can get to make money, and if you are new into this online world, you will get excited and feel it’s the best you have ever come across until it comes to the time for implementing all these strategies and then you realise there is more to it than was taught. What really matters is not just having these ideas and jumping into them randomly, but knowing when and how to implement each one of them will go a long way to help you achieve a better and more profitable result. If you are already knowledgeable in the online world, you might find it easier to profit from reading this book, as some idea may help you scale your already established business. That being said, this book does have great ideas if and when implemented right, will definitely help you make money but have in mind it won’t be anything close to the $10,000 he claims in 28 days. Here is our advice to you if you are truly ready to make money online and possibly live the Laptop life. Always have in mind that there is nothing like “get-rich-quick” online, and to be Successful, you will need an in depth training, and you will also need to put in lots and lots of hard work into growing your business to a profitable stage, with this you will need to exercise patience, be persistent and persevere until the results starts coming in. This is a business method that can actually generate you as much as that $10,000 per month, but it’s something that takes time and effort to build up. That said, if you feel your ready to really live this Laptop life and take the necessary steps and in depth training needed to get you there, proceed to our free step by step guide on how to make money online, and take a step into achieving your own financial freedom. That is it for today, hope this post helps you make an informed decision on The Laptop Millionaire. And if you found this post useful, please kindly share to help others. Everything that says to be rich in 28 days or rich overnight, I regard as a scam, seriously. The reason because of that is simple, it is like you said, there is no such way to get rich ovenright, and those platforms are just trying to get money from desperate people! Thanks for sharing, I think you save people witht his. Thanks for your comtribution too. Hopefully this review will help a lot of people keep their money in their pockets or be able to use it for something more beneficial. In my time as a digital entrepreneur, I’ve encountered so many offers like the “build a business that generates $10,000 in just 28 days” slogan that Laptop Millionaire suggests. The problem is that what works for one person rarely works perfectly for someone else. We all have our own interests, motivations, and desires for building this type of income. It is my belief that a sustainable online income takes time and dedication. Many people see great returns very quickly, but I wonder what their profit curve looks like in the long term. You are so right Tucker, it’s not just about making an instant cash but abouy what happens on the long run. This type of products don’t live that much and it’s so said because at the end of the day, it’s the innocent ones who buy into it that pay the price. I need the in-depth training when I buy in to something like this. I hate getting something and then finding out that they don’t explain the how-to’s and what-for’s. I need step-by-step instruction in order to get to where I finally know what I’m doing. Organizing your ideas is really important as well. Great review on the Laptop Millionaire. Thank you!! You ate welcomed Kaeyoes, it is definitely necvesary to have an indepth training and tutorial when startimg out on anything, as it will enable you learn more at ease, what you ate trting to do. But with Systems like this, their trainings are always half baked, if at all they have any. Most times it’s just one upsell after another for you to learn anything meaningful or useful. That is why we always recommend the platform we use, wealthy Affiliate were they give you a comprehensive step by step training om how to build your own sustainable online business. I can see how people, especially those new to internet marketing would get sucked into buying this book. Although it doesn’t look like a bad book to read for educational purposed, and after all it is a once off payment, so you could learn something valuable while going though the book. On the other hand, I have yet to meet a complete newbie that can honestly claim that they made $10 000 in their first month. $10 sounds more believable to me. However you choose to make your money online, all the methods are going to take time, patience and hard work. Otherwise everyone would be doing it. That is the simple truth Michel, no matter what method you choose to go, success online takes a great deal of time and effort to start seeing results. just reading a coup[le of books on get rich quick schemes will definitely not cut it out for you. the sooner people begin to realise that, the better they an sieve through all these scammy and low quality products. Hello Humphrey and Queen, thank you for this review. After reading it I came to the conclusion that it borders on being a scam rather than legitimate. The first sign was the $10,000 in 28 days. The learning curve on the average job is around six months. Can you imagine learning what you need to learn about online businesses in 28 days? The other thing is the Fast Track Program for $20,000. Anyone investing that kind of change upfront in a business you do not have the experience needs some serious help. Your suggestion is far more realistic and for anyone reading your review I fully recommend. But I will take on board that you do not consider it to be a scam, although it is obviously not for anyone who is just starting out in Internet marketing. You state that it does not give any advice about building a website, which is what every beginner would need, and I will definitely endorse instead the training at Wealthy Affiliate which you recommend, so that people may really understand what Affiliate Marketing is all about, and the best way to go about it. In my opinion the training which Wealthy Affiliate gives is by far the best that can be found anywhere. That said, would you really recommend this book for more advanced marketers? Very many thanks fo your really informative post. Hi Chrissie. Thanks for your input, it;s good to see you are on board with us. As for your question, We do not recommend this book to any one,be you beginner or advanced markerter The reason is very simple, here is a platform that will offer you more valuable information and step by step training on how to build your own sustainable online business. 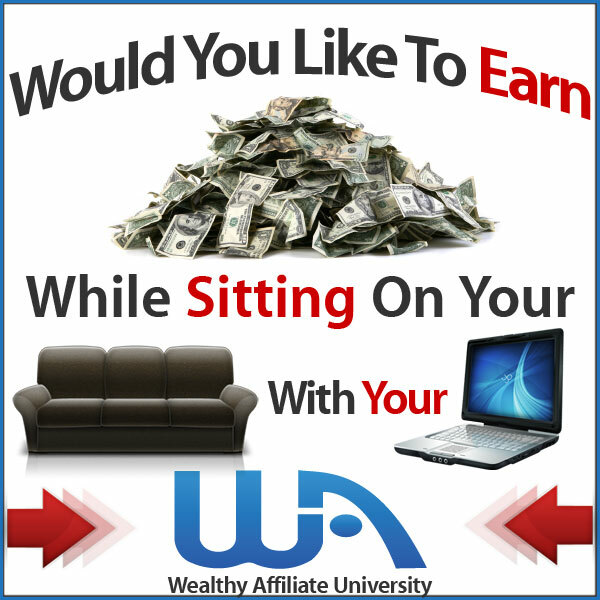 Try Wealthy Affiliate for free and see how i it goes. this is the same platform we and thousands of others use to start creating our successful businesses.